Progress continues despite the frigid weather. My little oil-filled space heater is getting a real workout. I started my day by chopping and sawing the joinery in the remaining two legs. After I finished that, I tackled the short end rails. I thought that I had enough cherry offcuts to make all four rails. Unfortunately, most of them were too short to be of any use. Two of them fit the bill however. Those I used as the lower rails on each end assembly. The remaining two rails I made from pine. First I cut the stock to rough length. The next step was to run each piece through my thicknessing jig. This resulted in each piece being square and identical in size. 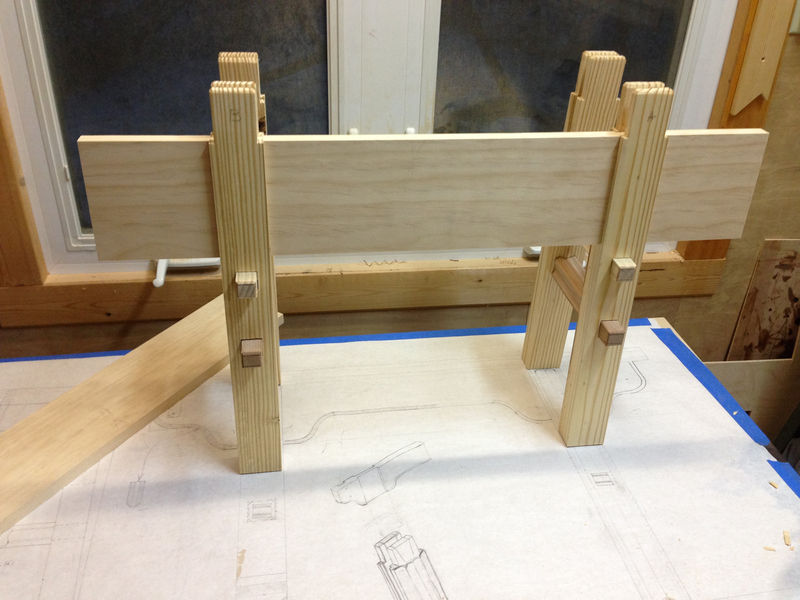 Each of these short rails will have a single tenon on each end with shoulders angled to match the slope of the legs. I began by marking the length between the shoulders of one of the lower rails directly from the shop drawings. Then I paired it with the other lower rail marking each at one time so that they would be identical. I repeated the procedure with the upper rails. 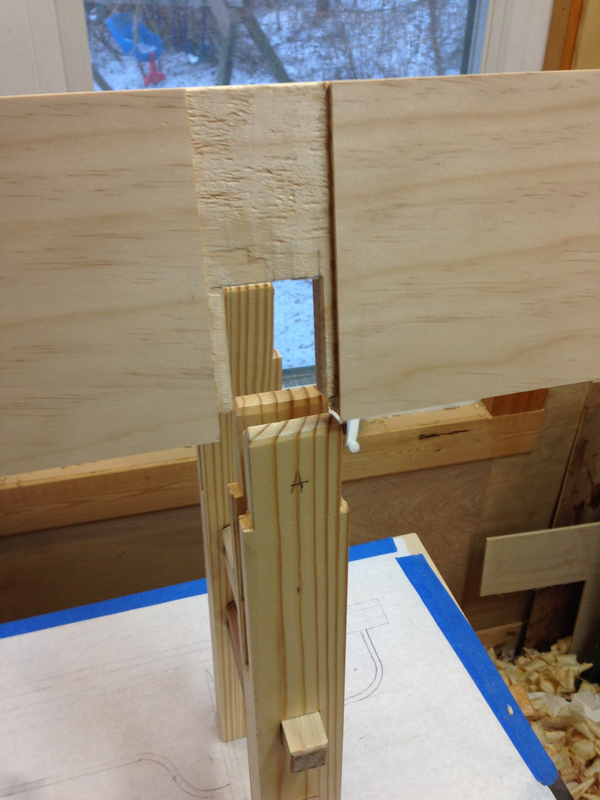 I then marked out and cut each tenon. Only after fitting the tenons did I flare the mortise openings to accommodate the wedges that will eventually hold everything together. It was now time to shape the profile of each short rail. I don’t have a lot of options when it comes to creating moulding profiles. 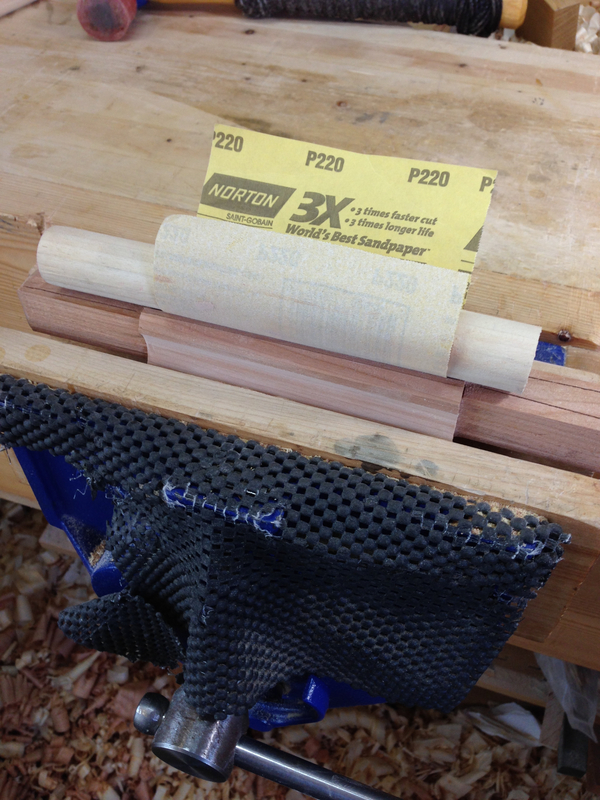 I have a slotted screw in a block of wood the I use to add edge beads. I also have a shop-made scratch stock which works well on hardwood but doesn’t perform all that well in softwood. 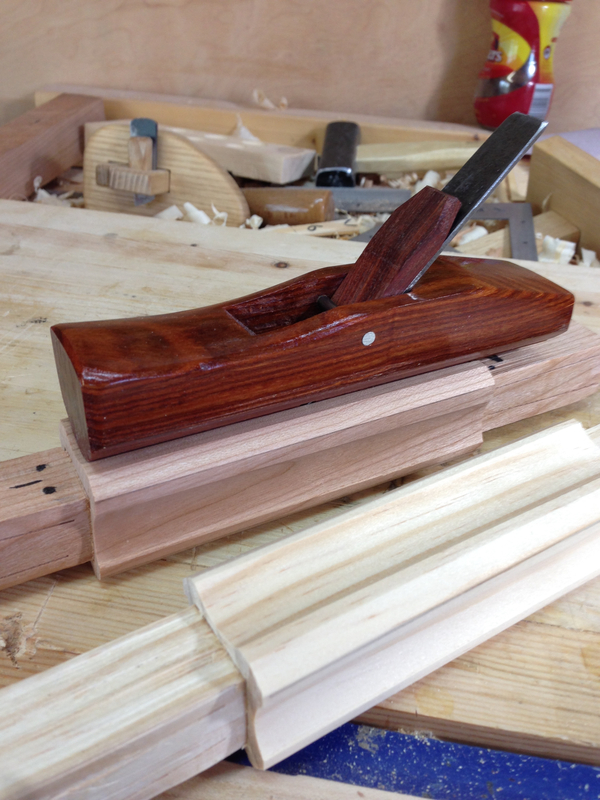 The only other moulding tool I have is a 3/4″ hollow plane. This is a Hong Kong sourced plane sold by Lee Valley. The price is reasonable so I thought I would give it a try. First thing, its small. The description on Lee Valley’s website says that it can be pushed or pulled. While technically correct, I found pushing the plane to very uncomfortable on my hand. Pulling, however, is much more comfortable and easier to control. The cut needed to be light. Otherwise I got a good bit of chatter in the cut. Bottom line is that it got the job done. These planes are inexpensive and I’ll probably add a few more to my tool kit. I chamfered all of the corners and then used a dowel wrapped with sandpaper to do some final cleanup. Once the rails were done, I did a drift of the leg assemblies in preparation of creating the long rails. 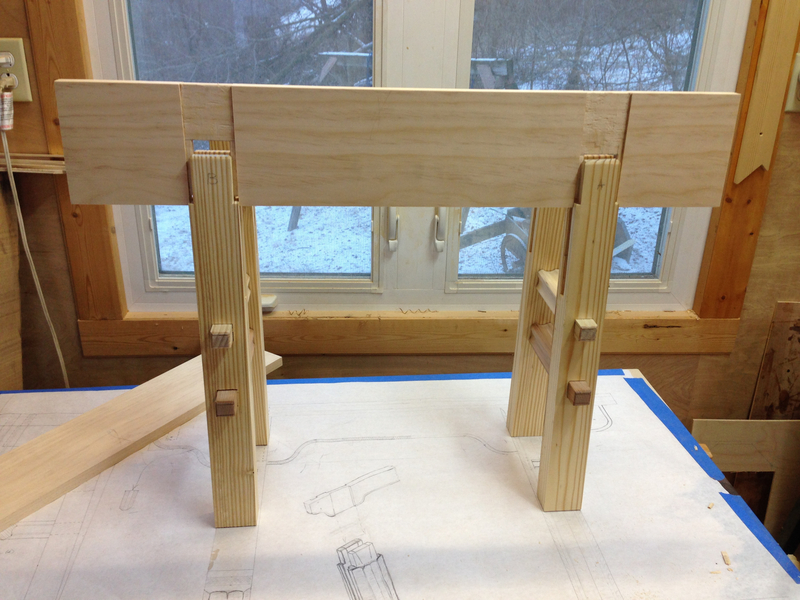 The long rails tie the leg assemblies together and adds both support to the seat and rigidity to the entire assembly. Again I used my shop drawing to mark the length of the rail as well as the distance between the legs. The long rail is saddled into the legs. I cut a housing dado on each side of the rail so that it fit into the slot on the leg. This is the tricky bit. If its too tight it will split the leg. If its too loose the whole assembly will be loose. So fitting goes a little slow in order to get the correct fit. I have to say that it is very satisfying to assembly joinery like this. Each piece adds rigidity and strength to the whole. Even with only one long rail in place this assembly is very rigid. The completed bench will be extremely strong and last a very long time. Tomorrow I’ll tackle the other long rail and at least start work on the seat. Assuming the little space heater can keep the cold at bay. The temperature is forecast to drop to -4 F tonight. 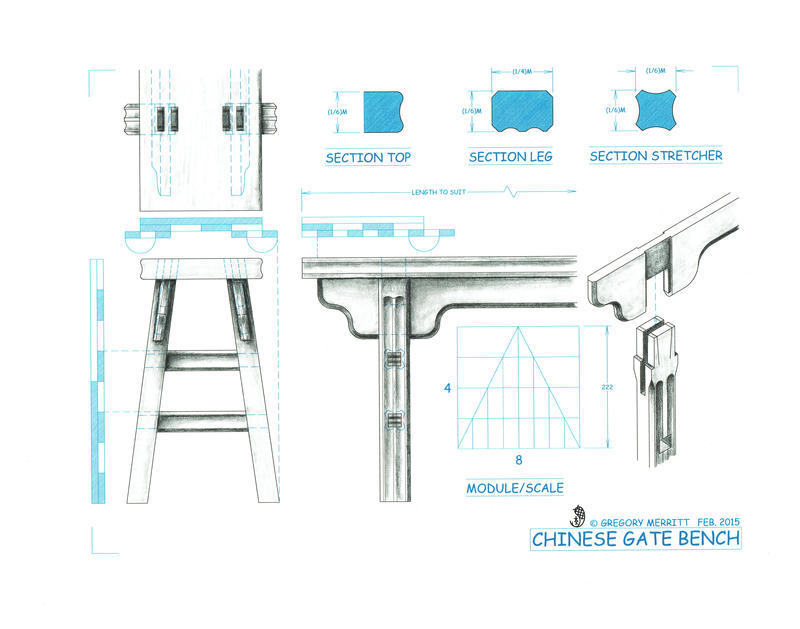 This entry was posted in Chinese Gate Bench, Design and tagged Woodworking. Bookmark the permalink. Lookin good. I’ve been wanting to hear about how some of the other Chinese wood planes from Lee Valley work out. I have the rabbet plane, and it’s very solid, especially given the price. Thanks. Like I said, it got the job done. I’ll be buying a few more sizes in the future since they seem to fulfill my needs. 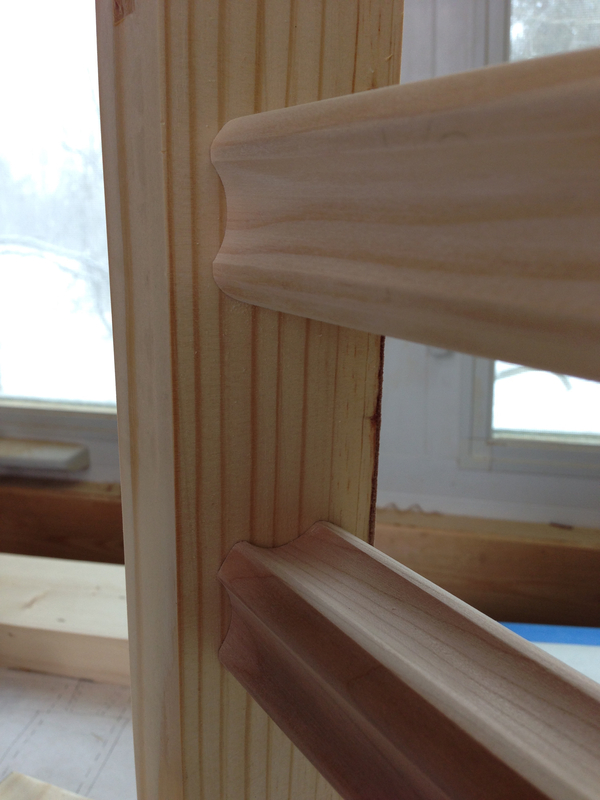 I don’t now, nor do I have plans, to use a lot of applied moldings in my work. I do however have plans to add profiles to structural members of the things that I build. These little planes will work just fine for that sort of work. I had similar difficulties with a Chinese made profile plane. This is my solution. Yours appears to be of a different manufacturer but its outline, I think, lends itself to this modification. Very inventive solution. Thank you for the link. Even though these types of planes have some issues, their price and functionality make them work considering. Lookin good Greg. I must admit, at first glance with a couple photos, i saw you had some bad glue runs…. Only to look closer, to see white window handles…. Greg, that is looking good. I’m slightly worried though, about the concept of hollows in the upper surface of rails like that. If this is to live outside the door, or gate, won’t they collect rainwater, which sits soaking into the joints? Maybe I’m just paranoid, since I live in Lancashire where it rains most days, even if the sun is shining . . . Thank you. I apologize for being unclear. My plan is to install this bench just INSIDE my front door. Something to sit on while taking shoes on and off.